Mired in financial difficulties, Pune based National Heavy Engineering Cooperative Limited (NHEC) is trying to revive itself in the coming days. The hope rises with the newly elected Chairman Sangramsinh Nalawade taking charge. He had been unanimously elected as the chairman in the election held in March this year. National Heavy Engineering Cooperative is supposed to have suffered losses amounting to a whopping over Rs 70 crore. It has recently submitted a proposal to cooperative lender NCDC for a grant-in-aid of Rs 80 crore. NCDC MD Sundeep Kumar Nayak, RBI Central Board Director Satish Marathe, Murali Krishna, Managing Director, NHEC and other officials will visit the Pune headquarters of the cooperative on Monday, said a source. Talking to Indian Cooperative, the newly elected Chairman Sangramsinh Nalawade informed, “For the past four years, the Talegaon Dabhade based unit is closed and no work is going here. The employees are not getting salary since four years. There are over 450 direct and 500 indirect employees connected with the society”, he underlined. The new chairman said ” We have a plan to take a grant-in-aid from the NCDC of Rs 80 crore to clear all the pending dues and make the unit operational. Earlier, we had submitted a proposal to MSC Bank”, he added. The new team also met RBI Central Board Director Satish Marathe and Sahakar Bharati National General Secretary Uday Joshi at Ghatkopar branch of Gujarat based Rajkot Nagarik Sahakari Bank and held a long discussion about the revival of the society. They also handed over a revival proposal to them for the NCDC. Nalawade added that, on 31st March Punjab National Bank issued a letter for auction of properties of NHEC but we asked them to give us two months’ time. The officials of the bank refused to give us more time. And finally, we knocked at the door of Debt Recovery Tribunal (DRT) and obtained auction cancellation order. Nalawade said that the Talegaon based unit of the National Heavy Engineering Co-op is spread over 105 acres and it is priced by the Punjab National Bank at Rs 442 crore. “We are having machinery worth Rs 14 crore. We are having a plenty of resources but due to lack of fund we are lagging behind”, he lamented. But recently, we received an order of Rs 22 crore from the clients and we hope we will receive orders involving more than 50 crore”, Nalawade said expressing hope of its revival on the phone. 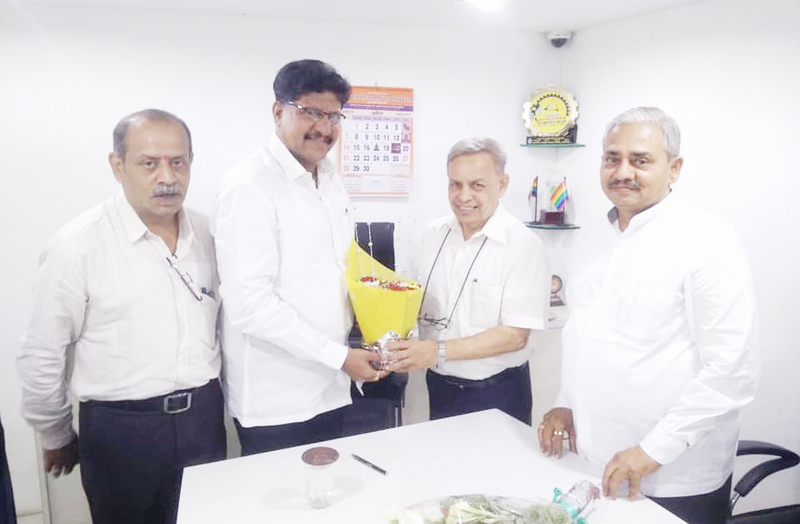 Meanwhile, Satish Marathe wrote on social media, “Today morning I felicitated Sh Sangramsinh Nalawade, newly elected Chairman of Ntl Heavy Engineering CoOp Ltd when he came to discuss steps to be initiated to revive NHEC which is now almost defunct. The Coop has a good Engineering set up coupled with experienced and skilled Workforce/Engineers”. “Earlier, Sh Nalawade felicitated Dr Udayji Joshi, Ntl Gen Secretary of Sahakar Bharati who had specifically come to participate in the revival discussion. Sh Raviji Joshi, Manager, Accounts, NHEC who facilitated the Mtg was also present during the discussion”, he further wrote. NHEC is a cooperative which has both national as well international clients. Top domestic sugar companies like Balram, Dhampur, Mawana, Birla sugar mills and others are its clients. It has also having International clients from Nepal, Bangladesh, Uganda, Kenya, Indonesia, Thailand, Ethiopia and others. National Heavy Engineering Cooperative is making sugar machinery equipment, equipment for cement plants, spare parts of wind mills, steel plants machinery and others.